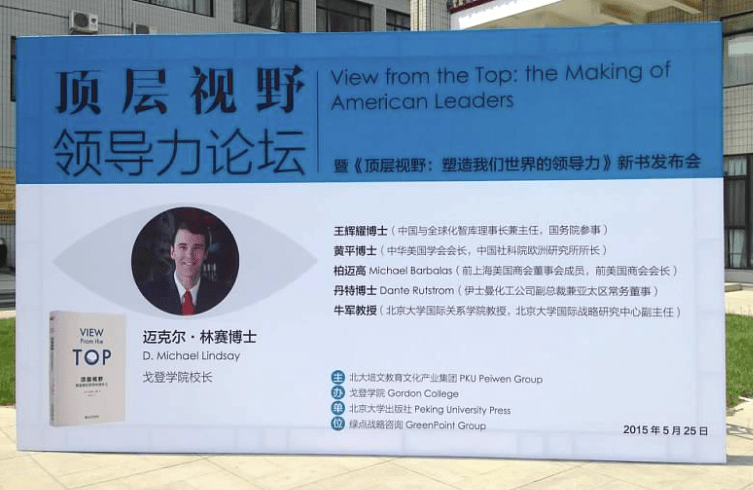 President D. Michael Lindsay’s recent book, View from the Top, is now available in Chinese. The Mandarin edition—published by Peking University Press, one of China’s most esteemed publishing houses—was released at Peking University in May. The event featured a public leadership forum on effective leadership in China and the United States. Among the four panelists were two Chinese and two American executives, including Gordon alumnus Dr. Dante Rutstrom ’80, Asia-Pacific Vice President and Managing Director for Eastman Chemical Company. After earning his B.A. in chemistry from Gordon, Dr. Rutstrom immediately entered a doctoral program at Tufts University, where he earned a Ph.D. in chemistry. He has been at the helm of Eastman for more than a decade. The book release event was part of a recent “Gordon Getaway” trip led by Michael and Rebecca Lindsay. Gordon friends and supporters spent nine days exploring the cultural, educational, and economic landscape of China, starting in Beijing and concluding in Shanghai.